Third generation wine maker, Tony Peterson, perfected his craft while working many years as an apprentice in his father's winery. All the while, he dreamed of creating an experience that would incorporate the traditional art of wine making, old world charm and the very best of modern amenities. Nestled in the fertile wine growing hills of Coloma Michigan, Contessa Wine Cellars is the realization of that dream. In order to provide our guests with the very best service, we require that all groups of 8 or more call for reservations. Maximum group size is 12 people. Larger groups may split into smaller groups with separate tasting reservations. Wine tasting is $5, and includes samples of up to five different wines. One payment for all tastings should be prepaid or paid upon arrival. All wine tasters must be over the age of 21 with valid identification. We will not serve anyone who is visibly intoxicated. No outside alcohol allowed on premise at anytime. 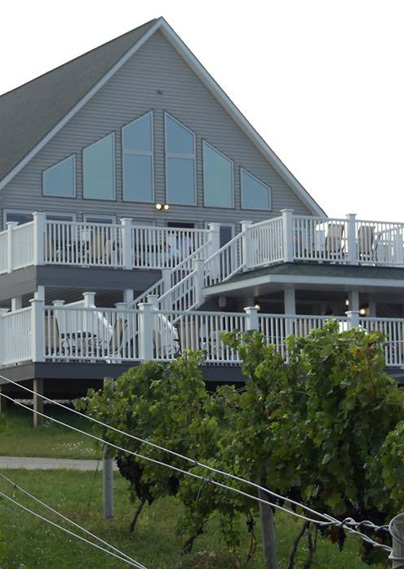 Weather permitting there is a beautiful deck where wine by the glass can be purchased and enjoyed. You may bring your own snacks to consume in the outdoor area, we just ask that you take it with you when you leave.